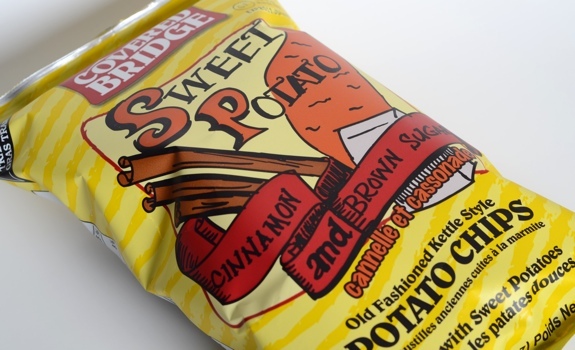 Covered Bridge Sweet Potato Cinnamon and Brown Sugar chips, in their colourful — but terrible — packaging. A little bit like Cinnamon Toast Crunch cereal, and a little bit like mini donuts doused in cinnamon-sugar, you’ve never tasted chips like these before. After my positive experience with Covered Bridge Smokin’ Sweet BBQ chips, I wanted to try another variety from the New Brunswick brand. While they make a lot of standard flavours, I’ve never seen anything like their Sweet Potato Cinnamon and Brown Sugar chips. Once I learned of them, I knew I had to try them. They taste every bit as good as the lengthy name would suggest. They’re sweet, from the sweet potato core to the brown sugar coating. They’re crunchy and oily, in keeping with the kettle chip tradition. The sugar isn’t chunky, nor is the cinnamon overpowering. Like other Covered Bridge chips, there are no preservatives or artificial colours or flavours. No trans fats or gluten, either. The ingredients list only contains five things: sweet potatoes, canola oil, brown sugar, organic evaporated cane juice, spice. All of that sounds good to me. The bottom line is that these things will freak you out. They’re really good, and the flavour is entirely unexpected. I’m so used to chips being savoury that I neglected to consider that they could pull off being sweet. I now know better. The colour of the sweet potato base makes these chips look burned ... but they're not. Cost: About $4 for a 142-gram (5 oz.) bag at Sunterra Market at Commerce Place in Edmonton. Availability: So-so. Seems pretty random. 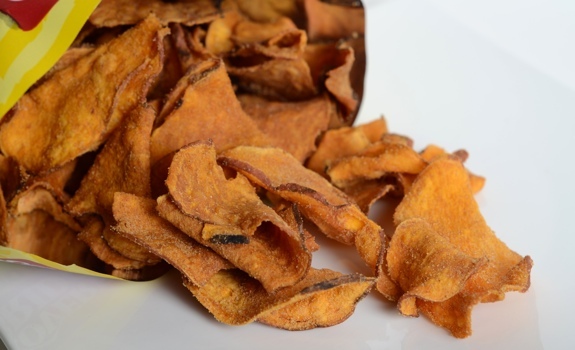 Check the Covered Bridge website for a list of local shops that carry their chips. Nutrition? : Sweet and oily means calories aplenty. 270 calories per 25 chips (50 grams). Loads of vitamin A. Quite a bit of fat, some fibre, some protein. If you finish the bag, you’ll regret it. But you probably won’t finish the bag, because the flavour becomes cloying after a handful. The packaging: Sigh. It’s every bit as ugly as on the BBQ flavour I tried earlier. I’d hate to see these things fail to find an audience because they look so bush-league. The bags really are utterly unappealing. The verdict: If you like sweet potatoes, try ‘em. If you like cinnamon and sugar, try ‘em. If you’ve tried every other flavour of chip out there, try ‘em. They’re not an everyday chip to chow down on while watching the game, but I can see buying them when I feel like something entirely different.